Among the top ten sprawling cities in America is Tampa- St. Petersburg with nearly a quarter acre of space for every resident. Imagine the water consumed per quarter acre. Surrounded by salt water on three sides these two places combine to make the 8th largest sprawling metropolitan area in the nation. Leading this list of "sprawls" is Atlanta, Houston and New York with Washington, Philadelphia and Los Angeles. Only in Atlanta, Houston, and Dallas do residents take up more space on a per capita basis than do people on the Florida suncoast, where Tampa and St. Petersburg thrive. As the only peninsular urban areas on the list besides New York, these suncoast cities face daunting transportation, air quality improvement, and water-use challenges. As sea level rises, due to climate change, in the Bay region flooding will actually increase over the next century as the Gulf of Mexico floods beaches, mangroves and river mouths. Sprawl is defined as low-density development as an inefficient use of land requiring reliance on vehicular transport and services. Both the rural loss of land and the paving over of natural features are serious because ecological services provided to communities by isolated wetlands, rivers, and forests disappear. In the last twenty years the nation has lost 14,545 square miles in the 100 largest cities to a development pattern known as sprawl. "There are more people and each of us is using more land to live on," reveals a recent study by Leon Konlakiewicz and Roy Beck. 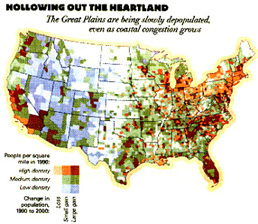 Every year 2.2 million acres change from natural or agricultural uses in the US to urban growth. Farm loss amounts to 50 acres every hour. Half the story in America's loss of space is population growth; the other half is due to increasing consumption. Neither cause of depletion could occur without cheap fuel. Electricity pumps water. Water and power as utilities drive half the sprawl equation. The water comes largely from reservoirs in the ground called aquifers or from lakes and streams. Land, known as watershed and recharge areas, is required to assure sufficient amounts of clean and healthy water. Instead Tampa is de-salting seawater to drink. As space is consumed three things happen. First water is contaminated by urban runoff. Second the area for cleansing the reserve supplies of water is diminished. Third the price of existing development is devalued. Development in the US over twenty years meant that the acre for acre pace of urban growth exceeded population growth by nearly three to one. Even cities like Detroit that lost population increased the developed area in the metropolitan region. As paved area sprawls heat derived from reflection increases. The Tampa Bay region already suffers from traffic congestion, salt-water intrusion into water supplies and over-pumping of ground water. The dirtiest air in the state is in the bay area. So too are the filthiest power plants in the southeastern region. Growth's tax on farms, parks and municipal services can be expressed in dollars and in opportunity lost. Tampa is the most dangerous place for pedestrians in America. Tampa also exceeded ozone standards, as a smog ingredient, more than any other Florida county in 1998. Low density, automobile dependent and energy intense development on the fringes of cities is typified by the bay region's sprawl. By just measuring population the Tampa Bay region was surpassed by 12 other urban areas in the southeastern region including Fort Pierce, Fort Myers and Orlando. Yet the Bay area was eighth in the entire nation in terms of sprawl, the person per acre growth. Like the southeastern region where 36% of the population lives in coastal areas, the Tampa Bay region is attracting people. Direct dollar costs in terms of roads, sewers, fire and police protection, schools, libraries and parks. A South Carolina Budget and Control Board study revealed that in 20 years the cost of providing services in that state would amount to $5.7 billion. Of that amount $2.7 billion is attributed to the cost of sprawl. For each revenue dollar collected, maintenance of urban land requires municipalities to pay $1.25 for services and facilities. States must supply money where property and sales taxes are too low to meet the demand for roads and schools. Congestion and distance make mass transit even costlier to provide low-income residents a means of travel to work. Indirect costs can be measured in terms of solid waste disposal, septic tank pollution, and loss of recreation, with growing noise and air pollution. Each cost consumes energy largely in the form of fossil fuels which when burned pollute the air and heat the atmosphere. Hillsborough County surrounding Tampa, however, is proactive. Although the region is ruunning out of fresh water, they have a greenhouse gas, pollution reduction strategy and have called on the state to act responsibly and plan for climate change. To know where we are ultimately growing one still has to ask, "When will the climate change in Tallahassee?" Florida data extracted: most sprawling metropolitan areas in the state.